Schafft Kunst neues Handeln? Konferenz am 29. November 2012, Cafe Moskau, Berlin. Prof. Dr. Wolfgang Ullrich, Professor für Kunstwissenschaft und Medientheorie an der Hochschule für Gestaltung in Karlsruhe, über die Abrgenzung und Schnittmenge von Kunst und Unterhaltung. Prof. Dr. Wolfgang Ullrich, Professor für Kunstwissenschaft und Medientheorie an der Hochschule für Gestaltung in Karlsruhe, über Kunst die in der Lage ist eine spirituelle Erfahrung beim Betrachter auszulösen. Prof. Dr. Wolfgang Ullrich, Professor für Kunstwissenschaft und Medientheorie an der Hochschule für Gestaltung in Karlsruhe, erklärt Kunstreligion. 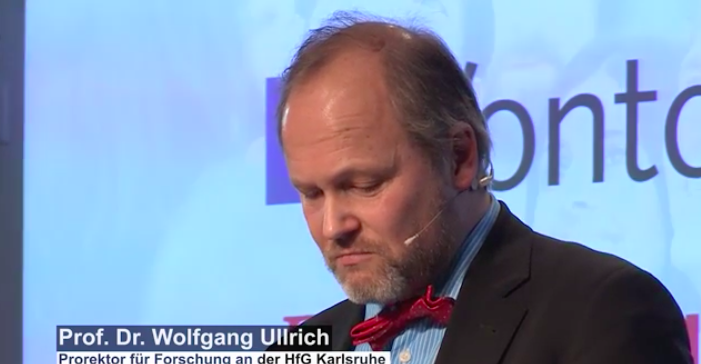 Prof. Dr. Wolfgang Ullrich, Professor für Kunstwissenschaft und Medientheorie an der Hochschule für Gestaltung in Karlsruhe, über die Künstlerangs vor dem Kitsch. Prof. Dr. Wolfgang Ullrich, Professor für Kunstwissenschaft und Medientheorie an der Hochschule für Gestaltung in Karlsruhe, über das vielleicht Vernünftigste auf der Welt: Kunst. Media philosopher und art historian Prof. Dr. Wolfgang Ullrich is a researcher in consumerism theory, pictorial worlds and the role of art in modern society. Munic-born Prof. Dr. Ullrich is a professor for art history and media philosophy at the Hochschule für Gestaltung Karlsruhe. After his graduation in 1994, he embraced various teaching oportunities, among others as a lecturer at the Academy of Fine Arts Munich and visiting scholar at the Academy of Fine Arts Hamburg. As one of Germanys major design conferences the see conference addresses the latest trends in the world of information visualization and provides a variety of insights into fields such as architecture, performance, film, art, technology, research and communication. The see conference promotes the experience of information and presented projects and people that fascinate us and can proudly be ranked among the most fascinating on their subjects. The German National Library currently lists more than 40 works published by Prof. Dr. Ullrich, not mentioning dozens of articles and columns for renown german newspapers like TAZ and Die Zeit. Among his publications: Habenwollen („must have“) and Bilder auf Weltreise („pictures going around the world“), being involvements with modern consumer culture and the imapct of pictures beyond cultural boundaries. Prof. Dr. Ullrich was awarded the third Martin-Warnke medal and the research award of the Aby-Warburg foundation. His book Raffinierte Kunst. Übung vor Reproduktionen was nominated for the non-fiction category of the Leipzig Book Award.